Here is a design of a telescopic cover for the Sherline lathe (please note this isn’t the full drawing). Why I need that? 1. Because I hate having to clean and lubricate the ways after every use. 2. Because all these debris can increase wearing on sliding parts. 3. Because this is very desired feature on a CNC machine. I made some delrin parts but drop the design. it I was more committed in doing something cool than functional. Probably it would work, but a simpler design was possible. 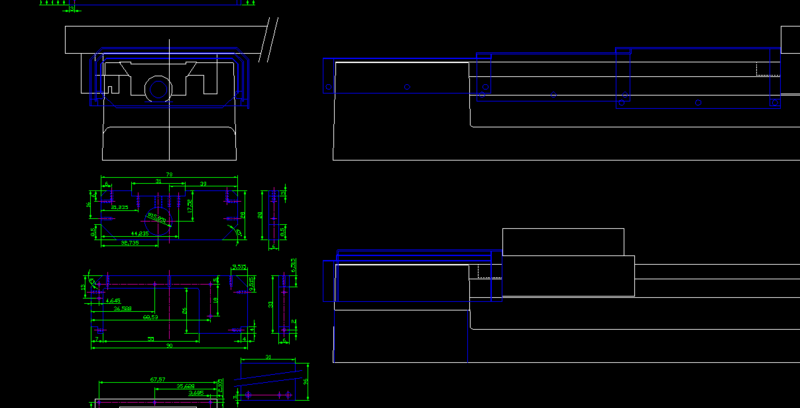 The simpler, the better, so all these nice parts will go to the bag of sample parts or be reused later. 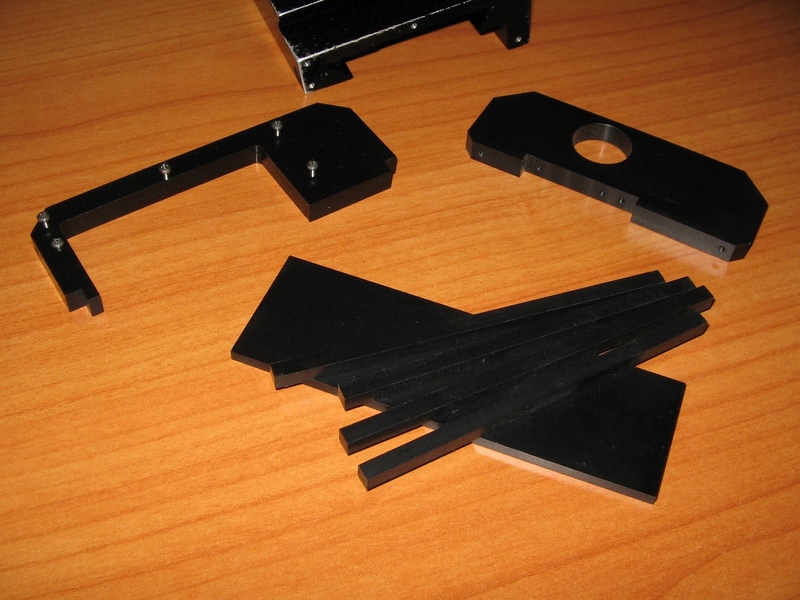 These parts looks simple, but there was a lot of hours involved in design and building. One good thing I learn about working with delrin was that, due to internal stresses of the material, you should do a rough cut of the shape of the part, and later finish all surfaces. 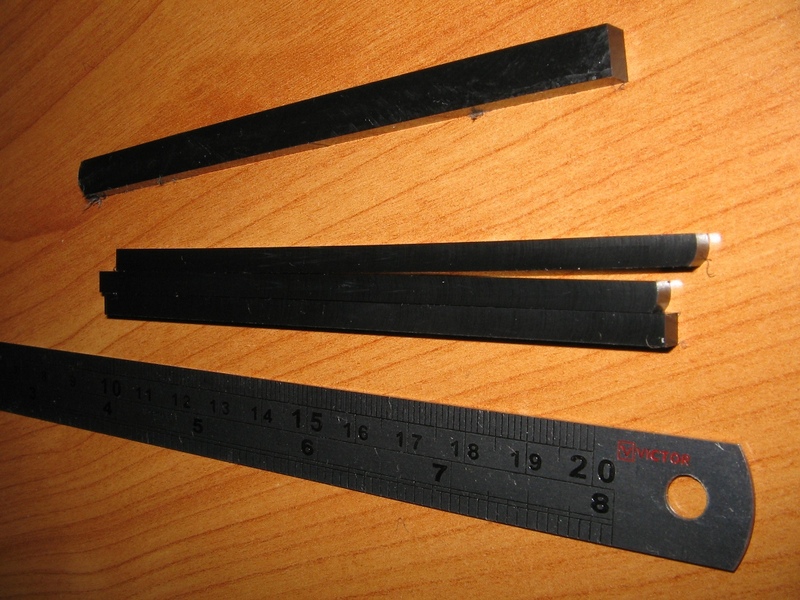 For example, to cut the straight bars in the picture, starting from a plate, a possible set of steps are: finish the edge of the plate, cut the bar and then finish the other three sides. The first bar below, done this way, has a evident warp. For the other two, I cut the bars slightly oversize and then did several set of passes over the sides, slowly getting close to the final size. This is a matter with thin parts; for compact and simple parts this is not an issue. I almost finish the new design for the cover, so hope to begin the building phase soon. Hi I can’t see the telescopic cover here? Can share more insight? I like to make one for the vertical mill column. It looks like a shield of armour able to extend and close with latching sections. As i said I never finish build of this design. But it work as follows. The telescopic cover is composed of three shells, made of 0.5mm aluminum sheet. The two larger shells have delrin side guides (I cut the bars but never cut the groove) to allow next smaller shell to slide into it. Every shell has, over the extreme border where it overlaps with the next shell, a strip of felt to allow a soft slide and avoid particles to enter inside (this isn’t at the drawing, but is key to the design). There’s no direct contact between two shells. Hope this helps.